Part of our mission at Marathon & Beyond is to provide practical advice on running or preparing to run marathons and ultradistances. 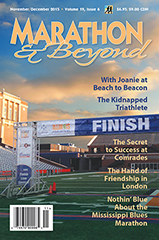 Our readers are healthy and active runners who set an example for both adults and kids. From time to time, we hear of a program that is worth passing along to our readers. Today, a third of American children are overweight or obese, posing a serious health threat to the future of our kids. This September, in support of National Childhood Obesity Awareness Month, Saucony, Inc., a leading global supplier of performance athletic footwear and apparel is issuing a national challenge to runners everywhere to help reverse this trend: Download Saucony Run4Good™, the running industry’s first-ever iPhone app dedicated to battling childhood obesity and inspiring people to run. With every mile, runners will be earning money for community youth running programs, putting kids back on the fast track to health. Five non-profit organizations were recently awarded a grant from the Saucony Run For Good Foundation™. For the next five months, beginning in September, a community mileage challenge will be set, and one of the recent award winners will be profiled. If the community mileage goal is reached during that month, Saucony will double its contribution to the featured organization. For more information on how the Saucony Run For Good Foundation™ can help local youth communities nationwide, visit www.sauconyrunforgood.com.